If your church wants to send a text to a large list of people, we have created a feature that allows you to do so while keeping your number from being flagged by the carriers and saving you time! We do have some safeguards already in place to keep you from getting flagged by the carriers when sending a lot of messages at once, but if you are planning on sending a message to more than 1500 people, adding secondary numbers will help you save a lot of time and frustration! When you send a message to a group of 500 people (or less), our current settings will send one message, per person, per second. If you are sending a message to 501-1,500 people, we will send one message, per person, every 2 seconds. For a message sent to 1,501-5,000 people, we will send 1 message, per person, every 3 seconds and for a message sent to 5,001-15,000 people, we will send 1 message, per person every 5 seconds. As you can see, sending a message to a group of 15,000 people from one number will take a VERY long time - it will take almost 21 hours to send to your entire list. This could cause some problems if people are receiving your message all through the night. In order to keep this from happening, you can add secondary numbers (we recommend having one number per 2,000 people). 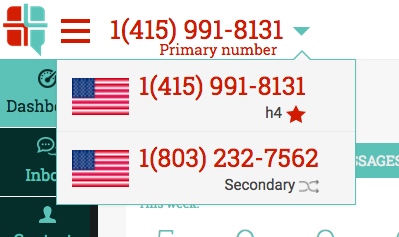 When you add secondary numbers, we are able to avoid the carrier from flagging your number and we can send 1 message, per person, per 1 second because the load is divided between the numbers. This cuts down the time it takes to send a message to 15,000 people from 21 hours to just 1 ½ hours! The primary and secondary numbers rotate and take turns on sending your message until they have made it all the way through the list. Once the messages have been sent, the contacts get “tagged” to the number they received the message from. The next time you send a group message this same way, each contact will receive the new message from the same number they received it from previously. This all happens automatically and behind the scenes! Let me walk you through how to set up secondary numbers. First, after signing into your PastorsLine account, go to the drop down box under your name and select “User Settings”. Next, click on the “Numbers” box. Next to the primary number you wish to add a secondary number to, Click the “Add” icon. If you already have purchased additional numbers, you will see them listed in the drop down box. You can only assign the numbers listed under the “Unassigned” section. Any number listed under the “Assigned” section is either already assigned as a secondary number or is assigned to another user and you cannot use those numbers again. Next, select the number you wish to make a secondary number and then click “Save”. When creating your group message, go to the group you wish to send to, and follow the normal steps for sending group messages (See the Help Section for more information on how to send group messages). After you have created your group message and added your text, select the “Use secondary number” option on the bottom, right hand corner of your message. Make sure that the number you are sending from is the same number you have your secondary numbers attached to. You can switch between numbers in the “Sending As” drop down menu. Choose to schedule your text or send it right away. If you need to know where to find your secondary numbers, you can find them under your "User Settings", then under "Numbers". They will be listed as secondary numbers below the primary number. You can also find a list of the secondary numbers by clicking the drop down box in the upper left corner of the screen. It is listed as the "secondary" number. Sending messages to a large amount of people has just gotten faster, more efficient, and we are still able to prevent your number from being flagged by the carrier.